Youthful syndicated columnist Brian Till on December 15 asserted that newspapers giving away their main product and service -- journalism -- can't continue. And he did so dramatically. "A lot of conversations I've had over the past few weeks have centered upon the American decline, not in terms of global influence and economic standing, but in terms of journalism," he wrote. "I've found myself speaking with students of the field, freelance writers and grayed reporters, all of us solemnly reflecting, as if a good friend had died. "And then something struck me," he continued. "I spend hours a day reading news, digging into any paper I can find, from Lebanon's Daily Star to the Buenos Aires Herald, but I've only purchased about a dozen American papers in the last year. "I, I realized, am the murderer of news." Each of us are "free riders " -- and fail to see how we've contributed to the stress, if not death, of U.S. newspapers, he adds, and charging a reasonable fee for information is an answer. The Chicago Tribune's announcement today that it was going bankrupt to protect itself from creditors while it reorganized was another example of newspapers at least somewhat covering its industry's woes, but broadcasting is starting to acknowledge the same problems -- leading to cutbacks, hiring freezes, consolidation of features such as distant/remote weather reports, and even layoffs. This morning's Mediaweek piece by Katy Bachman underscores how radio and television are profoundly affected by the economic downturn and related ties to drops in advertising. It's silent about loss of audience to cable and the Internet, which has been occasionally covered elsewhere, and about the colossal debt that some broadcasting groups are enduring almost as much as newspaper chains such as Tribune, McClatchy and GateHouse. However, it concedes that there are difficult times ahead next year, and implies that no one really knows what to expect. The Inland Press Association last week invited students to use the new online version of its 2009 Guide to Newspaper Internships. The free access to the 14-page pdf file is offered to assist job seekers in connecting with newspaper job opportunities. The directory presents internships offered by newspapers throughout the United States. There are internships in all major newspaper departments: news-editorial, online and new media, advertising, production and photography. Jobseekers also are invited to use Inland’s monthly newspaper to newspapers, The Inlander, which offers position-wanted advertising at $1 for every six words or portion thereof. A blind box costs $2 extra. The Inlander circulates to a paid circulation list of more than 4,700 newspaper editors and senior managers. All Inlander position-wanted. ads also are posted online at Inlandpress.org. The Associated Press is adopting a universal style for referring to all heads of state, including the United States. Effective Thursday at 3 a.m. EST, the AP will use the title and first and family names on first reference: President George W. Bush, not just President Bush; President-elect Barack Obama, not just President-elect Obama; President Nicolas Sarkozy, not just President Sarkozy. A dozen Western students are in Kansas City this week to attend the National College Media Convention, hosted by Associated Collegiate Press and College Media Advisers. The students all are staff members of the Western Courier newspaper. They’ll return Sunday after soaking up three days of workshops and presentations. They are Alisha Cowan, editor in chief; Dave Hodge, managing editor; Ed Komenda, news editor; Sarah Zeeck, opinions editor; Ken Woods, sports editor; Brent Busby, Edge editor; Adam Sacasa, photo editor; Zach Wingerter, copy editor; Rob Amaefule, assistant news editor; Karen Tablereau; Cody Boland, assistant Edge editor; and Martyn Davis, assistant photo editor. They’re accompanied on the trip by Director of Student Publications Rich Moreno, who will attend professional development sessions designed for newspaper advisers, and journalism assistant professor Mark Butzow, who presented a talk Thursday for student reporters and editors on writing stories for news websites. Students interested in a paid internship working for the Illinois State Legislature should starting collecting their thoughts and material for applying before the program's February 1 deadline. *Interns receive a stipend of $2,026 per month with health insurance included. * Interns earn 8 graduate credits in political studies from the University of Illinois at Springfield. * Interns work as legislative staff with either the partisan staffs of the Illinois General Assembly or the Legislative Research Unit. Interning with the Illinois Legislature prepares interns for a variety of career paths. Interns work closely with seasoned professionals in the unique environment of the State legislature. * Interns provide research and analytical support to committee leaders and members. * Interns analyze agency budgets and take part in crafting the state budget. * Interns handle press and newsletters for assigned legislators. * Interns gain personal access and build relationships with legislators, lobbyist and other state contractors. Interning with Legislative Research Bureau primarily prepares interns for research career paths, while working with seasoned legal and communication professionals. * Interns gain legal research skills. * Interns respond to research requests from state legislators. * Interns help write official state documents and resources. Upon completion of the program, interns pursue a number of professional avenues. * Interns are offered full-time positions on a legislative staff. * Interns pursue careers in public policy with a state agency or lobbying firm. * Interns pursue law degrees. * Interns continue their educational pursuits. The Illinois Legislative Staff Intern Program has a 35-year history and is considered one of the top internship programs in the United States. * Applicants must complete their undergraduate degree by September 1, 2009. * Applicants with advanced degrees are preferred. * Applicants with a 3.0 GPA are preferred. * Applications must be postmarked by February 1, 2009. * Internships start August 16, 2009 and end June 30, 2010. 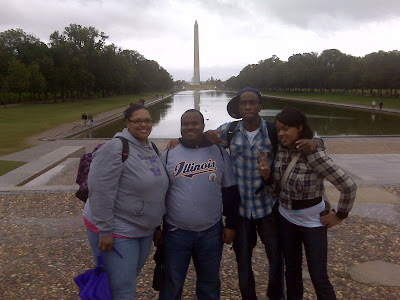 Four from NABJ/WIU visit D.C.
NABJ students tour monuments the day after the jobs fair. From left to right are Dameris Bagwell, Darryl Braxton, Robert Amaefule, and Shante Gill. The students were given train fare for the trip by English & Journalism interim chair Joan Livingston-Webber. Four students, members of the newly formed Western Illinois University chapter of National Association of Black Journalists (NABJ/WIU), traveled to Washington, D.C., for a jobs fair on Thursday, Oct. 23, and Friday, Oct. 24. NABJ/WIU President Rob Amaefule, Vice President Dameris Bagwell, and members Darryl Braxton and Shante Gill traveled with advisor Dr. Lisa Barr to the Howard University Communications Fair. The trip also included a tour of C-SPAN facilities on Friday night and sightseeing of monuments at the Washington Mall. He exposed the My Lai massacre, revealed Nixon's secret bombing of Cambodia, and has hounded Bush and Cheney over the abuse of prisoners in Abu Ghraib. 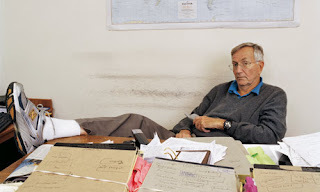 It's no shock that some government officials describe Illinois native and veteran journalist Seymour Hersh as "the closest thing American journalism has to a terrorist." An interesting site for undergrads to visit focuses on discussions about news media today -- especially how it concerns imminent or recent grads. "Well, at this stage I am trying to be as flexible as possible in my training, and to learn as many different aspects of the job as possible, thus allowing me more options when I graduate, but I think that a number of different roles could be ‘ideal’ for me. *Variety. Changing situations to face each day, being trapped in a boring ’same thing every day’ job will actually drive me insane. *New technology. My heart is more in the new media side of journalism. Blogging, RSS, innovating, mash-ups and breaking new ground really appeal to me. *Working with people. Meeting people and communicating is the probably best part of my day (especially at the pub :D). *Images/Video. I’m just a picture and video kind of guy. Not that print doesn’t rock my boat, but I love using multimedia to tell a story. I just think it’s more effective. *Being part of a team. I like being a go-to guy, to have specific expertise and to utilise it in a team environment. But also, you need to know what the rest of the team is doing as well. *Lots of money. Hahahaha. Yes, I know. If we’re going to say our ideals we might as well shoot for the moon. But I think we should be paid a good sum, as it can be a very stressful and involved job. "I’m going to call that short and sweet." The American Civil Liberties Union, a teachers union, and scholar advocacy groups all recently said that the University of Illinois Ethics Office went too far in its interpretation and application of state law prohibiting state employees from political expression and participation. So this week University of Illinois president B. Joseph White tried to put the flap in perspective, but since he conceded that there remain conflicts between the law and its campus use, it's perhaps not as reassuring as he intended it to be. Some 100 high school students from west central Illinois will participate in the Wednesday, Oct. 15 Journalism Day 2008 hosted by Western Illinois University's English and journalism department. With the theme "Preparing for Multimedia Storytelling in an Age of War and its Aftermath," the 8:30 a.m.-1 p.m. Journalism Day offers high school journalists seminars and panels led by Western Illinois award-winning journalism faculty; a screening of "Forgiving Dr. Mengele" with filmmaker and educator Bob Hercules; and a pizza lunch followed by a tour of the Western Courier, the University's student-run newspaper, and the public radio and television stations on campus. Hercules, the founder and co-owner of the Chicago-based television production company Media Process Group, will discuss the challenges of producing a film about Holocaust survivor Eva Mozes Kor, as well as the role documentaries play in today's multimedia journalism delivery environment. "Western's journalism program offers unique opportunites for students to learn journalism skills and the role media plays in society," said Mohammad Siddiqi, journalism program director. "We also provide students with options to specialize in public relations and advertising." • "Evolution of U.S. Administrations' Rules for Modern Press Coverage During War (World War II – Present), by Lisa Barr, journalism assistant professor and Journalism Day coordinator, Algonquin Room. • "Faces of the Enemy: Media Scapegoating and War," by Mark Butzow, journalism assistant professor, Board Room. • "Go There: Mobile Journalism from the Scene," by Bill Knight, journalism professor, Capital Room A. • "War and the Still Image," by Lisa Kernek, journalism assistant professor, Cardinal Oak Room. • "Big Wars Need Big PR: Selling the 2003 Invasion of Iraq," by Mohammad Siddiqi, journalism professor, Fox Room. • "From Idea to Advertisement: How Creative Concepts Become Breakthrough Ads," by Terri Simmons, journalism associate professor, Capital Room C.
For more information on Journalism Day, visit wiu.edu/English/news/f08/journalism-day.shtml. A Special Journalism Day Presentation: On Wednesday, October 15th at 7 p.m. award-winning documentary and film producer Bob Hercules will screen and discuss his film, “Forgiving Dr. Mengele,” in the Heritage Room at the Student Union at 7 p.m. Following the film, there will be a special discussion with Hercules and the subject of the documentary, Eva Kor. What is 'gotcha' journalism, anyway? The news media sure is taking a beating from one of the presidential campaigns, but it goes with the territory. It's interesting to us because the one having to endure hard questioning by prominent journalists (Sarah Palin) is someone trained in journalism back in the mid-1980s (her first career was as a sports reporter/anchor for an Anchorage TV station). This week she implied "it would have been unethical" (my quotes) to do that when she was learning the craft of journalism back at the University of Idaho. One of the Poynter Institute's go-to people on questions of ethics is Kelly McBride, who's first job out of college was in Idaho, by the way. Here is her reaction to Palin's assertion. This term "gotcha journalism" gained footing when the media started reporting on the private lives (usually, the sexual exploits) of politicians and candidates in -- you guessed it -- the 1980s. (Miami Herald staked out Sen. Gary Hart's house and caught him fooling around after he'd denied having an affair). I hope I've kept my politics out of this post, instead commenting on (defending or explaining) the climate politicians running for high office must face in recent decades. It's not new, and it's not legitimate to lump all hard questions (from Charlie and Katie) in with less-responsible gossipy stuff on blogs that spread rumors about candidates' private lives. Local TV stations' advertising revenues in the second quarter this year dropped 6.1%, and entwork TV dropped 4.8%, according to a new report about how the economy and related decline in advertisinig buys is affecting media across the board. The main damage to newspapers has been the move to the web of classified ads, but the overall market for print is substantial. What passes for thorough and impartial news coverage in the face of bipartisan Washington fear-mongering of the bailout of the financial industry brings to mind a terrific list of 12 questions about the future of journalism, which was written last month by Bill Kovach, former Washington bureau chief for the New York Times, a former editor of the Atlanta Journal-Constitution, and a former curator of the Nieman Foundation for Journalism at Harvard University. He asks, "How can journalists present engaging, verified information that diminishes messages of fear and self-indulgence?" 1. Has language been freed of journalism’s unelected gatekeepers only to fall prey to those who proclaim and propagandize, who offer self-serving advertisements or self-referential assertions rather than the kind of independently verified information that emerged from the Age of Enlightenment? 2. Will political advertisements, YouTube videos, and television comedians such as Jon Stewart supplant the printed word as the preferred form of communication about public affairs? 3. When news devolves into a fragmented private dialogue among family and friends in cyberspace, can journalists think of new ways to help people make sense of overabundant, undifferentiated information? 4. Do journalists recognize that distribution is now determined by the portability of technology and by the end user, and that reported material and analysis must now be organized to serve many differing audiences? 5. Supreme Court Justice Learned Hand said that in a democratic society we “have staked everything on the rational dialogue of an informed electorate,” and philosopher Hannah Arendt added that “freedom of opinion is a farce unless factual information is guaranteed.” How, then, can journalists use interactive technology to help citizens participate in verification and discussion? Can new tools engage the knowledge and experience of citizens as reporters, analysts, advisers? Can journalists using synthesizing technologies help citizens solve community problems? 6. Will our public education system take on the responsibility of educating students to think critically about their role in self government and about the type of information that role requires? 7. Can journalists use images, sounds, data mining, narratives, and interactivity in ways that connect their most serious work to the public? Can journalists see this as an opportunity to help people unlearn some of what they are being taught by the popular culture? 8. How can public affairs be reported in a way that enables citizens to track its impact on policy or test alternative outcomes? How can journalists present engaging, verified information that diminishes messages of fear and self-indulgence? 9. Will Internet aggregators such as Google develop algorithms that filter out propaganda designed to mold rather than to inform public-policy decisions? 10. What would persuade bloggers and other citizen practitioners to develop a commitment to independent thinking, verification, and ethical standards? 11. Can newspapers find an economic model to replace the loss of advertising to finance the work of editors and reporters who substantiate what is reported? 12. Will the public realize that the news they now acquire for free will rapidly diminish in quality and value if a new way is not found to fund its production by careful practitioners? As an old copy editor, I'll be paying attention to how the Chicago Tribune is changing, and how those changes go over with the public. One Chicagoan with an opinion (and his own blog about design!) is Ron Reason. So here's his take on the Monday rollout of the Truibune's redesigned three-section paper. At the bottom of his post, there are several good links for those of you interested in design. Two recent pieces about the Internet's influence and impact on print and -- more importantly -- content both speculate that newsmagazines and newspapers have value and will coexist with web-delivered news once workable business models are developed. Bob Guccione Jr. on Huffington Post is optimistic about newsrooms, writing, "The future couldn't be brighter, as soon as we recognize that digital technology is the modern-day equivalent of color printing and faster presses, and that the thing that feeds the new machine is the same thing that fed the old one: imagination. "The Internet is not a thoughtful entity," writes the former publisher of SPIN magazine. "It's a fertile ecosystem spawning a dazzling array of exotic flora, with the potential to improve mankind exponentially. It's an infinite network of railway tracks, along which travel an unfathomable number of rail cars loaded with thoughts and information, some of the cargo precious, some worthless. But the Internet didn't create any of it. It only delivers it." Eventually, media commerce will stabilize, Guccione adds. "The advertising model will shift from the unrealistic promise of infinite audiences to smaller aggregations of people really engaged, really interested, and predictably present," he writes. More idealistic -- and more combative -- is a piece by Chris Hedges for Truthdig. "Newspapers, when well run, are a public trust," Hedges writes. "They provide, at their best, the means for citizens to examine themselves, to ferret out lies and the abuse of power by elected officials and corrupt businesses, to give a voice to those who would, without the press, have no voice, and to follow, in ways a private citizen cannot, the daily workings of local, state and federal government. Newspapers hire people to write about city hall, the state capital, political campaigns, sports, music, art and theater. They keep citizens engaged with their cultural, civic and political life. "The decline of newspapers is not about the replacement of the antiquated technology of news print with the lightning speed of the Internet," continues Hedges, author of American Fascists: The Christian Right and the War on America. "It does not signal an inevitable and salutary change. It is not a form of progress. The decline of newspapers is about the rise of the corporate state, the loss of civic and public responsibility on the part of much of our entrepreneurial class and the intellectual poverty of our post-literate world, a world where information is conveyed primarily through rapidly moving images rather than print." Three newspapers -- the Chicago Tribune, The Oklahoman, and the Hartford Courant -- have just unveiled newly designed print editions. Here's an overview and Q-and-A's with the three redesign leaders. It was put together by the Poynter Institute, a great resource for journalists. On the Poynter site, you'll have the chance to follow a link to the Tribune's own online preview of its redesign. "The mass audience is drifting away, and resources should be focused on the leadership audience. If existing newspapers don't do it, new competitors will enter their markets and do it for them." Pour yourself a stiff drink and read more of the AJR article here. Journalism deputy director Bill Knight this year wrote a paper on journalism and poetry that USC's Image of the Journalist in Popular Culture organization has linked. "POETRY AND JOURNALISM by Bill Knight, Western Illinois University. Before poet and journalist Archibald MacLeish commented on the intersection of poetry and journalism in a lecture at the University of Minnesota 50 years this fall, journalism and poetry had seemed antagonistic or alien to each other for centuries. Knight explores the relationship between poetry and journalism in this thoughtful essay." The Chicago Headline Club has a new JobFile listing full of opportunity. This is from my introductory remarks before Kiyoshi Martinez' Monday appearance on campus at WIU. Obviously, journalism today is different than ever. But its fundamentals are mostly the same: Informing and entertaining audiences honestly. It’s changed from when I was a 16-year-old sportswriter for a weekly and a 28-year-old editor of a rock ‘n’ politics newspaper, a 35-year-old entertainment editor at a Washington, D.C. newsweekly, and a 41-year-old environmental reporter for a daily. In the last couple of years, that evolution has been upended by a revolution, one that has negatives, such as an unsustainable business model, to positives, from multi-media handheld devices you can use to call, text or Twitter, from choices of content from thousands of magazines and other print, web sites, radio and podcasts, and traditional TV. Our guest is going to share some ideas on the positive opportunities that, if ignored, could be negatives. Again, journalism is different than ever. But isn’t everything? I know a couple of economics-major seniors who planned on being hedge-fund managers and they’re thinking of career changes after last week. Next week, the Chicago Tribune is unveiling its new look and feel. Through change, drawing on foundations you build here, you can develop two key things: the self-reliance that’s invaluable to journalists—not being dependent on one source or your parents or teachers— and a zeal for lifelong learning – from do-it-yourself blogs now to internships to training. In fact, I’m taking a webinar on Thursday. Kiyoshi Martinez, architect of the popular AngryJournalist.com blog, spoke Monday at Western Illinois University and shared his thoughts about the current state of the journalism industry. He's written his observations about WIU and Macomb on his blog at http://kiyoshimartinez.com/nerdlusus/2008/09/24/post-presentation-thoughts-on-speaking-at-wiu/. Additionally, Martinez' speech was spotlighted in Wednesday's edition of the Western Courier, the WIU student newspaper. To read the story, go to http://media.www.westerncourier.com/media/storage/paper650/news/2008/09/24/News/Kiyoshi.Martinez.Enlightens.Journalism.Students-3448170.shtml. Throughout the day I’ll be meeting with journalism students and faculty and at 3:00 p.m. I’ll be speaking at the Union Sandburg Theater. I’m rather excited to be speaking to journalism students, as I was a student not long ago looking for a job. Currently, I’m polishing up my presentation, hoping that I don’t become one of those boring people with a PowerPoint. At the same time, I’m soliciting advice from the crowd for journalism students at AngryJournalist.com, and if you have thoughts you’d like to contribute please do." There's an interesting article about mid-career journalists embracing the changing nature of the journalism industry on the Society of Professional Journalists web site, http://www.spj.org/wpr.asp?REF=100#100. This year, the political conventions have tried to be more open to bloggers, video reporters, podcasters and new media. In 2004, the major political conventions gave a few dozen bloggers press credentials, a historic moment for the new media outsiders. In 2008, the Democratic convention credentialed 120 bloggers, and the GOP has credentialed 200 bloggers, according to Forbes. CHICAGO -- The unexpected news that Jay Mariotti quit the Chicago Sun-Times will gladden the heart of countless sports fans here, who have gobbled up countless gigabytes in the blogosphere documenting their hatred for the sportswriter. An interesting analysis of how the newspaper industry, as a whole, messed up its various attempts to break into the online world can be found at http://valleywag.com/5039619/5-ways-the-newspapers-botched-the-web. Q. I graduated from J-school this May with a newspaper concentration, and I'm interning abroad this summer. Every week I get e-mails from friends who are beginning their newspaper careers in the States and watching newsroom morale crumble around them. One friend says an editor pulled her and other interns aside and told them to get out of the business while they still could. Another intern told me he's the only one in his office who's sure he'll still be working in a week's time. A metro reporter who's only 24 already believes her own job isn't safe. I still don't think it's that difficult to break into newspapers, especially in small towns or through multimedia. But what about keeping those jobs five years or 10 years down the line? Even if small papers continue to do well, where are the chances to move up going if it's the major metros that are cutting jobs? Sure, Web skills are important, but being able to write HTML or edit video (as it seems almost everyone can do now) won't ensure survival in an ailing industry. It seems to me that the print media industry is headed for a far more compact -- and competitive -- incarnation. I don't mean to come off as alarmist, but I think my concerns are legitimate. So my question is this: If you had graduated college this May, would you have gone into newspapers? And for us budding writers who are still young and unfettered, is it time to switch paths? A. If I came out of school this year, I would not be banking on a long career in newspapers. But I would still study journalism. When I got out of journalism school, I had no idea in the world that I would ever become such a thing as a newspaper recruiter. I had never heard of one. And then I became one and absolutely loved it for 18 years. And even way back then, more than 30 years ago, we were taught to produce journalism for print, video and audio. My points: you cannot have your whole career figured out now; uncertainty can include great things; we can't confine ourselves to one medium. Newspapers are changing, to be sure, and not in pretty ways. Some will not survive. Others will evolve in ways that make them almost unrecognizable -- except that they still do journalism. I know that video skills are hot today, that everyone is trying to acquire them and that they will soon be surpassed by something else. Evolution has always been the case. But now, change is moving at warp speed. And it is not just happening in newspapers. Don't believe that our brothers and sisters in other industries are having an easier time than we are. They're as worried as we are. Dealing with this junk takes guts. And it is risky. Yes, many people are getting hurt by this transformation. And some are benefiting. Right now, it seems to me that more are getting hurt. But just as you are at the beginning of a career, all of us are at the beginning of a historic transformation. No one can give you any assurance about what will happen or where we'll wind up. But we are beginning to see some of what it will take to succeed: adaptability, entrepreneurship, initiative and an audience orientation. If you have a passion for journalism, if you have the qualities I just mentioned and if you can work like hell, I think your chances are pretty good. A new way to pay for news you want? You think your local water supply is polluted. But you’re getting the runaround from local officials, and you can’t get your local newspaper to look into your concerns. A group of journalists say they have an answer. You hire them to investigate and write about what they find. The idea, which they are calling “community-funded journalism,” is now being tested in the San Francisco Bay area, where a new nonprofit, Spot Us, is using its Web site, spot.us, to solicit ideas for investigative articles and the money to pay for the reporting. But the experiment has also raised concerns of journalism being bought by the highest bidder. Sister Joan Chittister in her National Catholic Reporter column "From Where I Stand" this week mourns the loss not only of the late Tim Russert, but also his skills and the social consequences of his use of them. "Tim Russert was trying ... to make citizens out of voters, thinkers out of listeners," Chittister writes. "He was trying to form a real democracy rather than simply throw pottage at herds of politicized sheep. "He was not sensational, not confrontational, not destructive," she continues. "He was a real thinker. He was a real political philosopher for the age. A real journalist." High praise for a guy who earned it. Online Journalism Review may be folding soon, but Robert Niles there posted a terrific analysis of the deep divide between journalism and television. Taken with insightful comments to the posting, it offers positives and negatives about TV, traditional journalism and the loss of public service in a press mission that somehow drifted into Profits Uber Alles. Three accomplished journalists who graduated from Western in May were accepted into the prestigious Public Affairs Reporting program at the University of Illinois-Springfield, director Charlie Wheeler said. Journalism majors Jason Nevel and Drew Thomason and broadcasting major/Journalism minor Alex Degman will make up 15% of the 20-student program. The one-year program combines classroom coursework and internships with professional news operations covering the Illinois General Assembly and state government. Grad students earn Master's degrees upon completion of the program. Nevel was editor of the Western Courier, Thomason the Courier's web editor, and Degman a student reporter for WIUM-FM 91.3. An Aurora high schooler picked by Western's Society of Professional Journalists chapter and WIU faculty as winner of the Midwest Region's High School Essay Contest also won the national award, SPJ announced. Mark Brouch of Aurora Central Catholic High School won a $1,000 scholarship in the annual competition, which this year had the thme "Why Free News Media Are Important." New media guru Rob Curley, recognized as one of the leaders in the online journalism field, is departing the Washington Post to head up new media at the Las Vegas Sun. He explains the decision in his latest blog entry at http://robcurley.com/2008/05/24/earlier-this-week-it-was-108-degrees-in-las-vegas. I heard now-retired newspaper columnist William Raspberry talk about Journalism once – as a trade – reporting being as vital and hands-on as plumbing or wiring. For graduates (and acknowledging Hall of Fame baseball announcer Ernie Harwell) here’s a salute to Journalism. Journalism is reporters teasing President Bush at a White House dinner and a child reading the funnies with a mom in White Hall, Ill. It’s the infamous newsroom bums such as Jason Blair and Stephen Glass, sure, but it’s also Sy Hersh, Helen Thomas and many others who keep finding truth and sharing it. A quiet guy clipping a friend’s obituary – that’s Journalism. So is the pair of young Washington reporters churning out story after story until a President is shamed into resigning. It’s America, Journalism; an epic poem, a play, a nation’s portrait – remade every day. It’s the New York Times and a community weekly. The color comics on Sunday, a small-town paper’s uptown web site, USA Today’s sports section, and the births and deaths in countless newspapers of record from coast to coast. And ink made from soybeans and newsprint that can soak up spills or be recycled, almost anywhere. There’s a man in Moline who remembers a story he read by a courthouse newswoman or a kid in Morton who clipped a human-interest piece by a man who took risks for readers. That’s Journalism. So is the subscriber calling for extra copies of the paper with something about a neighbor in the Food or Arts section. It’s a retired teacher phoning the newsroom with complaints about a typo on page C-6. And a grinning photojournalist giving a high-five to a violinist or gymnast after a first solo or balance-beam routine. Journalism is “the first rough draft of history,” it’s said, a spirited sprint to record facts and feelings. It’s also an art and a craft to seize moments. Many are noticed – heroism or failure is seen, cheered or booed, and hopefully understood. Some become numbers; others memories. In Journalism, democracy grows. The only race that should matter is the race to deadline. The creed is the AP Stylebook. Color is something distinguishing a feature story or photo. Journalism is a foreign visitor asking about the late, great Carl Rowan or Molly Ivins, Hunter S. Thompson or Ruben Salazar. How could America produce and relish the likes of Randy Shilts and I.F. Stone, Vincent Chin and Margaret Bourke-White? Or the First Amendment itself, or SPJ or the Newspaper Guild. It’s Herblock cranking out classic editorial cartoons and Henry Stanley exploring Africa in search of Dr. Livingstone. It’s a race to a radio for an immediate report from a scene, or someone standing in a hurricane for a weather forecast. Journalism also is the critic lecturing a painter about perspective, and a scientist trying to write a 600-word op-ed piece due tomorrow. Journalism is jazz without music. Math without grades. Video games without violence. A woman out West can’t tell you the color of her husband’s eyes but she knows the Dow Jones or the Consumer Price Index or her favorite CD is up or down. That’s Journalism. So is the corporate-minded Newseum in Washington, D.C. And the ex-reporter, still writing while circling the drain teaching at a college somewhere. Journalism is continuity. A tip, then a source to verify. Desk to deadline to press time. Download, upload, podcast and blog. Idea to illustration. Pictures and stories to audiences’ eyes. It’s rain soaking the stoop where the paper lies dry in plastic. And lightning making the radio crackle and the TV crawl with warnings. And the flash of email alerts and RSS feeds from keyboards in distant lands, humming like an huge engine fueled by and driving information. Journalism is a sleepy carrier or a smart-aleck copy editor. The old-timer whose scoops increase every time he remembers the past. A woman celebrating a conviction of a crook or profits at a local factory or good prices for crops by throwing the paper in the air. Journalism is the cool, clear eyes of Ida Tarbell or Ida B. Wells, the flashing brilliance of Mike Royko, and the daring exploits of adventurers as varied as Nelly Bly and Richard Harding Davis, Marguerite Higgins and Floyd Gibbons. Journalism, just a job? It’s work, but more. As complex as the American spirit from which it benefits, it’s a trade, a business and, sometimes, even a faith. Journalism is Tradition written in skinny notebooks. And Shame in missing a story. It is Courage in exposing the lousy treatment of veterans. It is Humor in Dave Barry making us laugh out loud. It’s Amusement in all the crossword puzzles, horoscopes and supplementary flavors that help the hard news go down. And it’s Emotion, going with what you got and working on a follow-up for tomorrow. Names are Journalism, too. The Hawk Eye, High-Country News and Herald-Whig, the Picayune, Porcupine and Pantagraph; Pulitzer, Scripps and Hearst. Journalism is a noisy, frantic newsroom where hopes and feelings run as rampant as relay teams or political candidates. It’s a corner pressroom with coffee-stained desks. It’s the endless lists of names in race results – from tracks or voting booths. The griper and grumbler is Journalism, too. He wants to finish a novel or go on the radio or be on cable TV; nothing’s ever good enough; “whaddaya got today?” And he wants decent wages – and deserves them. Journalism is the newbie, too – the recent grad who goes from the Midwest to Texas on spec, just for an interview or tryout. His Girl Friday and The Paper, The Daily Planet and the Daily Bugle, Walter Cronkite and Bill Moyers, CBS’s Edward R. Murrow on the radio or TV and the Guild’s Heywood Broun on picket lines or beneath headlines. Journalism is interns – with experience no bigger than the lumps in their throats – trying to begin a dream. It’s veteran scribes, too – tired old hands of 45, knees gone, praying to stay with the work they love. Every week, day, hour – minutes now – Journalism is the story of David and Goliath, of Sinbad, Paul Bunyan, of Jackie Robinson and the Lord of the Rings. It’s H.L. Mencken covering the Scopes trial, William Allen White writing a heart-breaking obit of his daughter, Grantland Rice describing the Army-Notre Dame game with the Four Horsemen – “Outlined against a blue, gray October sky …” – Ernie Pyle filing from World War II’s “worm’s eye view,” and John Hersey reporting from the ruins of Hiroshima. Journalism is not a job description, it’s said. It’s a diagnosis. This diagnosis is a trade for democracy, for America, this Journalism. Through the centuries, Journalism has extended from James Boswell and Ambrose Bierce, plus the many nameless reporters at innumerable statehouses, cop shops and press boxes, through Marvel Cooke, Joe Galloway, Gene Roberts, Pete Hamill and Amy Goodman. Journalism is Reuters and Rolling Stone, Clarence Page and the AP, Red Smith and Daniel Pearl. Sacrifices were made, lives given for Journalism. Don’t disgrace it; celebrate. A post on the blog Innovation in College Media last Thursday is aimed at Journalism grads and it's mopre insightful than most comparable advice -- plus it's fairly applicable to a lot of fields. There's a lot of commentary about how the mainstream news media failed the public and their own mission in the months leading to the invasion and occupation of Iraq. However, Editor & Publisher chief Greg Mitchell in a column promoting his new book points out the "contributions by everyone from relatively unknown reporters to ... comic Stephen Colbert and singer songwriter Neil Young." Check out Some 'Unsung Heroes' of Iraq War Coverage (published March 18). 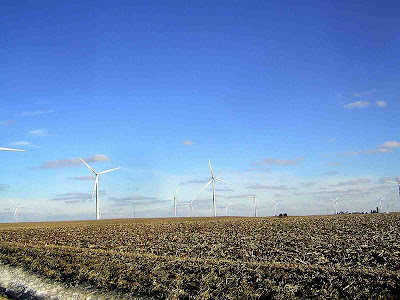 WIU grad student Catt Foy took this photo of the Crescent Ridge wind farm in rural Bureau County, where the Journalism 400 Topics class in Environmental Journalism recently visited. Omar Sofradzija, who attended WIU in the early '90s, has been named adviser to the State News student newspaper at Michigan State University in East Lansing. He formerly worked at the Las Vegas Review Journal and the Peoria Journal Star. Illinois figures prominently in three compelling background stories generated from the Student Press Law Center in Washington, which stepped up postings to connect with Sunshine Week, marked by the Society of Professional Journalists and other news organizations. Northwestern University's Medill School of Journalism has been in the news lately for several reasons, including charges that the school's dean may have fabricated a story for an alumni publication. Check out the latest controversy—this time regarding a proposal to change the name of the school—on Eric Zorn's blog at the Chicago Tribune. Go to http://blogs.chicagotribune.com/news_columnists_ezorn/2008/03/medillname.html. The Medill School of Information and Influence? The route to "newspaper" survival keeps getting trickier. Not so long ago, the combination of a solid news report and a reasonably enterprising advertising business was considered sufficient to sustain a newspaper. The bar rose with such added online innovations as hyperlocal coverage and niche efforts aimed at such targets as moms and pet owners, all accompanied by increasingly sophisticated advertising. Now the American Press Institute's influential Newspaper Next project has concluded, in a sequel to its original report, that it will take a great deal more for newspapers to flourish in the digital era. The report says newspaper companies will have to venture farther afield and become the indispensable guide to everything that anyone in their local community needs to know to live there. And provide all kinds of solutions for all kinds of needs for virtually every local business. Business-side readers will want to scavenge the 24 case studies of new products piloted since the first report came out in mid-2006, along with the seven examples of how newspaper companies organized and financed innovation. Some of the efforts are truly unorthodox -- a newspaper-run consignment store for quality goods in Ogden, Utah, (page 64), which provides an upgrade from classifieds to get rid of that couch. Or QC.com (page 37), an ingenious version of online coupons at The Dispatch of Moline, Ill., that works both to attract and retain subscribers and draw in small-business advertisers. Journalists may be more interested in the first few conceptual pages. They will find in a chart on page 7 that news is still part of the core in this concept of the future, but it is quickly dispatched as "not big enough" to be economically sustaining. Stephen Gray, managing director of the project, writes that newspaper companies need to redefine themselves as the "local information and connection utility" in their communities. Perhaps, as he writes later, a suitably big and audacious goal would be to create a wiki'ed "Localpedia," comprehensive but built with volunteered user content. As he told me last fall, Gray found boffo demand for the road show consulting he did during 2007, coaching companies on how to implement Newspaper Next. However, many of the experiments have stuck too closely to traditional core competencies, making money, for instance, by reverse publishing online material into print, still the comfort zone for the ad sales force. The result: the pace of change is unprecedented but not quick enough; most projects are too small and too slow to develop revenue on the scale needed. So the report urges newspapers companies to "make the leap" beyond news or even news and information. Newspapers should be venturing into unfamiliar territory like online promotions, e-mail advertising and tailoring events information into a personal planning calendar -- as well as finding creative solutions for business beyond traditional advertising. The new report also contains a useful bonus chapter from consultant Gordon Borrell on maximizing online revenue. It expands on some ideas I wrote about last fall after interviewing Borrell -- newspaper companies venturing into local search with separate commerce-only sites or aggressively going after the nascent local online video ad business. Borrell thinks there is big money to be made there. Western's independent student-run newspaper earned the most first-place awards in four years at last weekend's Illinois College Press Association conference in Chicago. Congratulations to the Western Courier. "The list of ICPA awards includes: 1. First Place, headline writing (daily) 2. First Place, feature story (daily) 3. First Place, news photo (daily) 4. 3rd Place, General Excellence (daily) 5. 3rd Place, headline writing (daily) 6. Honorable Mention, sports page design (all papers) 7. Honorable Mention, entertainment supplement (all papers) 8. Honorable Mention, critical review other than film (all papers)," said Courier adviser Rich Moreno. "Additionally, the Courier won Third Place among daily papers (despite not being daily) for General Excellence," he added. Despite publishing three times a week, the Courier competes against daily newspapers such as the Daily Illini at UIUC. The Chicago Headline Club/Society of Professional Journalists' JobFile, produced by Bob Roberts in cooperation with the Illinois News Broadcasters, has a new list of job opportunities. Illinois State Rep. Linda Chapa LaVia (D-Aurora) last Saturday visited WIU's Environmental Journalism class held over five weekends at Western's Quad Cities campus in Moline. Chapa LaVia, shown at her computer at the upper right, is a member of the legislature's Environmental Caucus. She discussed areas that lawmakers have, can and should address, and urged citizens to get involved in environmental, conservation and other stewardship issues. MONTCLAIR, N.J. — Montclair State University's student government decided Wednesday to temporarily restore funding to the school's weekly student newspaper, after its decision to freeze the paper's funding a week ago was criticized as an attempt to stifle freedom of the press. After more than five hours of deliberation, the Student Government Association legislature voted 12-0, with seven abstentions, to restore funding for printing and office supplies to The Montclarion for 30 days, during which time student government and newspaper leaders are expected to try to resolve their differences. "What's most important is that Montclair State University will have a newspaper tomorrow," said Karl de Vries, the newspaper's editor-in-chief. Editors found out when the spring semester began last week that the paper's funding had been frozen. The student government also contacted The Montclarion's publisher and told it not to print the paper's issue last Thursday; an online version was produced. Editors said the budget freeze was punishment for the paper criticizing student government for regularly holding closed meetings, in possible violation of New Jersey's open meetings law. Student government leaders say that they're not censoring the newspaper, but that the paper's editors overstepped their authority when they hired a lawyer to help them get access to the meetings. The New Jersey Press Association, the Society of Professional Journalists, the American Civil Liberties Union and the Arlington, Va.-based Student Press Law Center criticized the budget freeze. "You're not only hurting the newspaper staff, which is having their free speech cut off, but the campus, which is being denied a valuable source of information," said Frank LoMonte, executive director of the law center. De Vries said the student government wanted the newspaper to turn over correspondence between the newspaper and a lawyer The Montclarion had previously retained to challenge the student government's practice of closing meetings. The government fired the lawyer in November. Shayna Jacobs, The Montclarion's news editor, said that in the past, the association has required it to be the conduit to all correspondence to its attorney. At the Wednesday meeting, association President Ron Chicken argued that the budget freeze wasn't about censorship. Bryan Fucetola, an association legislator, argued that the newspaper broke student organization rules because it wasn't authorized to hire its own attorney and instead should have consulted the association's attorney. Since the fired attorney had been paid for with association money, Fucetola said the student government had a right to see what editors had discussed with the attorneys. "We just want to know what we paid for," Fucetola said. But attorneys for the New Jersey Press Association and the American Civil Liberties Union argued that the editors had a right to expect lawyer-client confidentiality, and that the association could face serious legal troubles by shutting down a student newspaper. Montclair State's student government controls the budget and in any given year provides a third to half of the money needed to publish the paper, available for free on the campus, about 14 miles west of New York City. The university doesn't directly control the association, but after Wednesday's vote, Karen Pennington, the school's vice president of student development and campus life, said she was confident the administration would be able to successfully mediate. This column appeared in some west-central Illinois newspapers early this week. People don’t become journalists to become rich or popular. It’s mostly a calling to let others know what’s going on – whether grade-school science fairs, local tax proposals, area sports or world-wide conservation. Still, some college students are stunned when they see Gallup’s annual poll gauging people’s opinion of various professions’ ethics and honesty. The most recent one again shows journalists in the middle of a list of dozens of professions – from the appreciation of nurses (83% say they’re “high” or “very high” in honesty and ethical standards) to the disdain for lobbyists (just 5%). But the numbers can be shocking to a 21-year-old undergrad dreaming of covering crime, business or rock ‘n’ roll for print, broadcast, the web or some other future medium. Less genuine shame than a sort of newsroom gallows humor, such remarks can hide four key points concerning public opinion about journalists – and other professions. Still, many people regard reporters as panderers of lies for profit, invaders of privacy, or water carriers for Authority – unless they happen to know a journalist. Then, their overall opinions may not change, but journalists people know from the neighborhood or church or bowling are treated like Congressional incumbents. Voters don’t much like Congress – except their own representative, which accounts for most politicians’ re-elections. People might even concede that the journalist they know practices the profession’s ethical code, which generally holds that journalists seek the truth and report it fully, act independently, be accountable and minimize harm. Still, that’s explained as the exception proving their opinion. The second point is that most people associate journalists with disturbing content. A variation of the “blame the messenger” impulse, criticizing journalists for reporting on a lousy war, a slipping economy, a hometown loss or a pal’s DUI is like hating car salespeople because your vehicle needed a valve job after 150,000 miles. Bad news, sure, but some salesperson’s fault? The other two points are a bit worrisome for the press but deeply troubling for society. Besides the tepid enthusiasm for journalists (23% “high” or “very high” esteem -- 12th out of 22 professions), there’s an eagerness to dislike journalists (26% say “low” or “very low” – the 9th worst). People seem more eager to dislike others. Lastly, people’s opinions are uniformly trending negative, comparing the new poll to earlier ones. Every single profession previously measured, from the upper ranks (pharmacists: 71% “high” or “very high”) to the lower levels (advertising practitioners: 5%) has dropped. Clergy, physicians and Congressional representatives all fell 5% in a year. People’s lost respect for the professions seems unhealthy – even if they’ve transferred that admiration to occupations such as the building trades, software engineers or other jobs. As for aspiring journalists: You want to be popular? Consider nursing. You want to be rich? Think about being a lobbyist. But neither one will let you tell your community stories about local heroes, shenanigans in Springfield, corporate corruption or the high school play. The Free Flow of Information Act (national shield law legislation) passed in the Senate Judiciary Committee in October 2007, and the National Association of Broadcasters is now urging Senate Majority Leader Harry Reid to bring the bill to a vote in the full Senate. In a January 28 letter to Reid, Rehr says of the bill, which would set standards for when federal courts can and cannot force journalists to reveal their sources, "This legislation will help ensure the flow of important information to all Americans by allowing journalists to protect the identity of their confidential sources." Rehr continues, "Broadcast journalists take seriously their responsibility of serving every local community with timely news and information. This bipartisan legislation strikes a careful balance between ensuring citizens stay informed and honoring the public interest in having reporters testify about their sources in certain carefully defined situations." Those situations would include disclosures that could prevent imminent terrorist action or significant harm to national security. Rehr notes that 33 states and the District of Columbia have shield laws in place already, and 16 other states have recognized reporters' privilege in court cases. "However," he says, "there is no uniform set of standards in federal courts to govern when testimony about sources may be sought from reporters." The House approved a companion bill in October, and Rehr is requesting Reid's support in bringing the bill, with its current language in place, to a vote in the Senate. -- from Radio Ink magazine. While too many mainstream news organizations are cutting back on foreign correspondents and war reporters in Iraq understandably are limited in their access, a “citizen news” operation continues to cover Iraq on the ground and win a few journalism awards as it does: Alive in Baghdad. A survey being compiled by the University of Maryland for The Newspaper Guild labor union shows dramatic drops in key press values, according to journalists surveyed for a "Future of News Jobs" survey planned for publication in the next issue of the American Journalism Review. The top three values when respondents started their newsroom jobs were accuracy, credibility and timeliness, the survey finds. Now, however, "making a profit" is the overwhelming value, at 96.3%, followed by a distant second, "attracting an audience," at 73.2%.